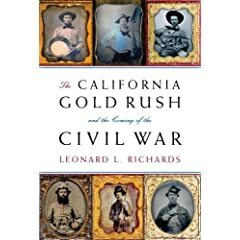 Richards: "The California Gold Rush and the Coming of the Civil War"
With this book, Leonard Richards gives us an overview of California's role in the emerging sectional conflict of the 1840s and 1850s. Bracketed by a recounting of the famous Broderick-Terry duel, the narrative is quick moving, darting back and forth between state and national political issues and figures. It begins by briefly retelling the story of the discovery of gold at Sutter's Mill and the mass international migration to the gold fields. The author's discussion of the technology involved in the mineral extraction was interesting, especially in the recounting of efforts to preserve individual claims and resist industrial and corporate interests. However, once the "easy" pickings were made (a very brief period), the capital required to extract the gold was beyond the means of individual miners. Although there was little doubt California would be a free state (as a whole, the miners were decidedly free labor advocates), powerful political figures like Senator William Gwin cultivated significant pro-Southern interests in the state. Richards credits the riches of California for the impetus to build a transcontinental railroad, leading to the inevitable heated disputes over the merits of a southern vs. northern route. Although clearly futile, effort was also made by pro-Southern politicians (with the support of influential Mexican landowners in Southern California) to divide the state in half. Unfortunately, in-depth analysis of the state's various ethnic groups as political forces is largely unexplored. The state's admission as a free state also directly led to renewed Southern pressure to annex Cuba (either through purchase or conquest) or conquer territory in Central America for the expansion of slavery. The various filibustering exploits of William Walker are discussed, including his final disaster in Nicaragua. Interestingly, Richards merits the efforts of Cornelius Vanderbilt as critical to Walker's downfall. It's a fascinating side story. What is missing is the recognition that expansion into the Carribean and Latin America was an extremely controversial position among Southerners, a point wonderfully illustrated by William Freehling in his recent book The Road to Disunion (vol. 2) . In the end, Richards perhaps devotes too much space to broadly national issues like the Kansas-Nebraska Act and "Bleeding Kansas". These subjects have been covered deeply and well by other authors, and while they provide needed context to the issues raised by California statehood and economic clout, their extensive coverage relegates the state to the shadows for large stretches of the book's middle. California's election of 1860, secession efforts, and the outbreak of civil war are only briefly covered in the epilogue. On the other hand, on this point of criticism I may be projecting my own desire for a more narrowly focused study rather than viewing the book on the author's terms. Richards's study of how California fed the flames of sectional conflict is painted with the broad brush strokes of popular history. It's a familiar story for sure, but it is written from a mostly interesting and often fresh 'west coast' perspective. 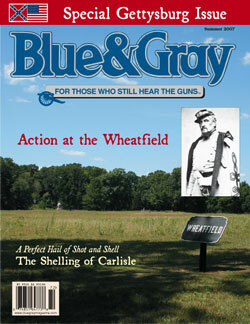 A preview (well, the TOC anyway) of Blue and Gray Magazine's annual special Gettysburg issue has been posted on the publication's website [I wish I lived in a world that would accept an annual Pea Ridge special issue]. While this event normally passes me by with little interest, I did note the inclusion of the long awaited discussion article (pages 47-50) about the Farnsworth's Charge controversy. Last year, Andie Custer wrote an article that turns the traditional interpretation on its head -- a conclusion that is vigorously challenged by historians and others that have heavily researched the event. Here, Eric Wittenberg and J.D. Petruzzi respond to Custer's findings. I look forward to a lively (and hopefully civil) discussion among the three. I guess I am expecting it to be an instructive expose, at least of one part of the proliferation of published pet theories emanating from this particular battle. They can superficially appear to be well documented (like this one dealing with Farnsworth's Charge) and others can garner awards [see the 2005 winner, here, of the Richard Barksdale Harwell Book Award]. In Deadly Earnest: The History of the First Missouri Brigade, CSA -- by Phil Gottschalk. An out-of-print and highly sought after unit history. The California Gold Rush and the Coming of the Civil War -- by Leonard L. Richards. Amongst Immortals Raging: Gettysburg’s Third Day Begins -- by Marshall Conyers. This is actually a volume of poetry. I can't say that's in line with my Civil War reading interests, but I thought I would at least acknowledge its arrival as the publisher took the effort to send it to me. The Maps of Gettysburg: The Gettysburg Campaign, June 3 – July 13, 1863 -- by Bradley M. Gottfried. Plenty of Blame to Go Around: Jeb Stuart's Controversial Ride to Gettysburg -- by Eric Wittenberg and J. David Petruzzi. Fort Hays: Keeping Peace on the Plains -- by Leo Oliva. "The Burning" of Osceola, Missouri -- by Richard F. Sunderwirth. (Two Trails). Bonds: "Stealing the General: The Great Locomotive Chase and the First Medal of Honor"
In the spring of 1862, two dozen men drawn from Ormsby Mitchel's division of the Army of the Ohio and led by adventurer James Andrews participated in a daring raid behind enemy lines. Rather than summarize it here, I'll presume that most readers know the general points (if not, check out the author's website, here). It is certainly a saga that meets all the requirements of high drama. I'll admit to not having much prior interest in the Andrews Raid, but I found myself completely absorbed by author Russell Bonds's stylish account. Phenomenally well written, organized, and presented, Stealing the General is a masterful narrative history of the raid's planning, execution, and somber aftermath. The journey southward, the stealing of the locomotive General, the chase, and the ultimate capture of all of the raiders is only half the story. The book also details the men's long imprisonment, court trials, and escapes (both foiled and successful). Eight of the men, including Andrews, were executed by hanging, while the rest either escaped or were paroled. Most were awarded the Medal of Honor, with a group of the raiders being the first recipients of the new decoration. As a writer, Russell Bonds is exceptionally adept at building dramatic tension, a task not so easy to succeed at when describing well known events. He also possesses finely tuned descriptive and analytic powers, traits that undoubtedly serve the author well in his law career. Eleven of the sixteen surviving raiders published their 'story' in one form or another, and Bonds does a wonderful job of reconciling these predictably self-serving, fanciful, and often contradictory accounts, duly noting where the task is found to be impossible. In company with many other writers and historians, I think Bonds can be a bit too hard on General Buell in places. I can think of nothing else I could possibly quibble with. I did appreciate very much the author's lengthy assessment of Ormsby Mitchel's unfortunately brief wartime role (he died of disease later on that year) and his division's military operations prior to and during the raid. It is a necessary context in order to fully understand the purpose of the raid and perhaps its degree of foolhardiness. In terms of editing and presentation, Stealing the General is a first rate publication. The maps are attractive and useful, while numerous photographs give a human face to all the characters involved. As a niche publisher, it is hoped that Westholme continues to be involved in the Civil War field. As with many items of recent scholarship, the subject of historical memory is an integral part of this particular study. The author meticulously pieces together how the story of the raiders was formed in the public imagination, with all the inevitable jealousies and indignations among the numerous participants vying for credit. While successive reunions often served to soften some of these attitudes among friend and foe, a turf war arose over ownership of perhaps the most tangible item from the raid, the General itself. These conflicts serve as yet another fascinating element of Bonds's all-encompassing study. I heartily recommend this engrossing, award-winning study of the men and events surrounding "The Great Locomotive Chase". For the foreseeable future, Stealing the General will likely be considered the definitive treatment of this bold yet tragic venture. --------------------------------------------------------------As one who appreciates inventive and visually arresting cover art, I must say this is one my favorites of recent times. [authors shopping for a publisher take note] - Westholme has also impressed me with its ability to get multiple copies of its books into so many bookstores over here. In this area, Civil War bookshelf space is small and dwindling fast, so it's no mean feat. As you can see by clicking here or on the sidebar link, I have put together various reading lists or links to bibliographical compilations. A recent radio interview with an author sparked me to create a short list of Civil War Kentucky campaign and battle histories. The interviewer made the rather cavalier assertion that Kentucky served as a buffer during the war and saw little fighting. Of course, in broad terms relative to other Border and Upper South states, there is a grain of truth to this but significant campaigns and battles occurred in Kentucky nonetheless, especially during the first two years of the war. Below is a selected reading list of military studies I found useful. Where is all the Morgan stuff (one might ask)? Truth is, the Morgan literature has never really grabbed me much, beyond the recent Gorin book listed below and an excellent section of James Brewer's Raiders of 1862. Perryville: This Grand Havoc of Battle -- by Kenneth Noe. The best overall treatment of the battle. Perryville, Battle for Kentucky -- by Kenneth Hafendorfer. Remains a good microtactical history of the battle. Rumored to be yet another revised edition in the works. The Battle of Wildcat Mountain -- by Kenneth Hafendorfer. Definitive treatment of this SE Kentucky campaign. This book (along with Mill Springs and Richmond) shows the author at his more recent best. The Zollie Tree -- by Raymond Myers. An out-of-print classic. Battle history section is clearly supplanted by Hafendorfer's exhaustive account of Mill Springs (see below). Includes a fairly detailed biographical sketch of Felix Zollicoffer. Mill Springs -- by Kenneth Hafendorfer. War in Kentucky: From Shiloh to Perryville -- by James McDonough. Not a favorite of mine, but the only modern study that provides a complete overview of the 1862 Kentucky Campaign. The Civil War in Kentucky -- ed. Kent M. Brown. Excellent collection of essays, dealing largely with military events. When the Ripe Pears Fell -- by D. Warren Lambert. Another out-of-print classic. A history of the Battle of Richmond (also see Hafendorfer below), beautifully presented. Battle of Richmond, Kentucky -- by Kenneth Hafendorfer. Thunder From a Clear Sky -- by Raymond Mulesky. Click on link for review comments. Morgan is Coming! -- by Betty J. Gorin. A Masterful Retreat -- by Lewis D. Nicholls. A useful book, largely due to the dearth of Cumberland Gap studies. Click on link for review comments. They Died by Twos and Tens -- by Kenneth Hafendorfer. Not Hafendorfer's best, but useful as an exhaustive reference for 1862 Confederate cavalry organization, units, movements, and engagements. Also out-of-print. The Battle of Belmont: Grant Strikes South -- by Nathaniel Cheairs Hughes, Jr. While Belmont is a Missouri battle in the narrowest of terms, there are strong Kentucky elements in Hughes's study, esp. in the focus on Columbus. Forts Henry and Donelson: The Key to the Confederate Heartland -- by Benjamin F. Cooling. Also has informative western Kentucky coverage. Fort Donelson's Legacy: War and Society in Kentucky and Tennessee, 1862-1863 -- by Benjamin F. Cooling. eds. Pitcock and Gurley: "'I Acted From Principle'"
Dr. William M. McPheeters was an exceptionally well-educated physician and native North Carolinian who found himself in the middle of the political firestorm that was wartime St. Louis. Prior to the outbreak of the fighting in Missouri, McPheeters had a successful private practice in the city and was also a respected medical educator. Although he was a pro-Southern sympathizer, he committed no overt acts of support for the Confederacy when war broke out. Nevertheless, he and his family were quickly targeted by the authorities. The quote from the title refers to the doctor's stand against signing an oath of allegiance in lieu of property confiscation and ultimately imprisonment or banishment. His belongings seized, McPheeters fled south alone and ended up on the staff of General Sterling Price. Beginning in 1863, the doctor's diary provides a daily account of his stint in the medical service of the Trans-Mississippi Department. As indicated by his writing, his position seems to have allowed him a rather unregimented army life when not on active campaign. McPheeters tends to avoid "shop talk" in his journal, speaking of his medical duties in mostly broad strokes. Also, given his frequent interaction with prominent officers (and growing friendship with Sterling Price), it is rather unfortunate that the doctor did not recount any of these conversations for posterity. Additional commentary deals with military campaigns such as the Battle of Helena, the Little Rock Campaign, the Red River Campaign and Price's Missouri Raid. Oddly enough, his entries seemed to increase in length as the war dragged on, making the daily journal of the Price Raid particularly useful. Unless I am searching for specific information for research purposes, I generally dislike reading Civil War diaries and journals in their entirety, finding even the most celebrated ones rather mundane. Often for me, greater points of interest lie in the editorial commentary and notes. As expected from such a well regarded work as I Acted From Principle, the editors do not disappoint. Blocks of daily entries are collected into chapters and each is introduced editorially with fine background passages that provide context for the journal entries to follow. It's all done seamlessly and well. Of equal helpfulness, the notes are frequent and voluminous, enlightening the reader with extensive additional background and explanatory information. An unfortunately common trait of edited diary and letter compilations is the lack of maps. Not so here. A number of maps are included, tracing both general military movements and the individual journeys of Dr. McPheeters and his wife when present. It's a nice way of helping readers follow the daily movements described in the diary. 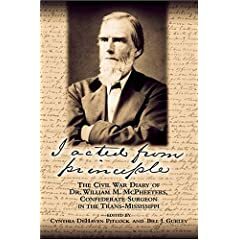 With skillful editing and exhaustive commentary, notes, and indexing, I Acted From Principle is a leading example of how primary source materials should be published and presented. I would highly recommend this volume to any reader interested in the the charged atmosphere of border state politics, the practitioners of Civil War medicine, and the conduct of the war in the Trans-Mississippi theater in general. ------------------------------------------------------------------BTW, I love the photo cover art. The stern visage, erect bearing, and folded arms are a perfect visual representation of the sentiment expressed in the title. Cox: "The Battle of Marianna, Florida"
Although detailed modern histories are few and far between, the state of Florida saw its share of military action during the Civil War. Expanding upon his previous research (1989), Dale Cox has now given us the first full account of Union general Alexander Asboth's raid into northwest Florida that culminated in the September 27, 1864 Battle of Marianna. As Cox makes clear, the town of Marianna was an important communication and transportation center in an economically important (and largely untouched) region of the state. By 1864, regular Confederate forces were withdrawn from West Florida to reinforce threatened fronts deemed to be of greater importance. This vacuum allowed ever larger and better organized bands of army deserters and Unionists to roam the countryside freely. Under the aegis of the U.S. Navy, refugee camps for both escaped slave and white Unionist families were established along the coast. They proved to be fertile ground for U.S. recruiters. Into this scene stepped Hungarian emigre Alexander Asboth and his mixed force of white cavalry and USCT (82nd and 86th) mounted infantry. 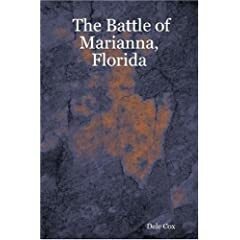 In The Battle of Marianna, author Dale Cox does an excellent job of setting the stage for the first significant inland incursion into West Florida by these Union forces. The deteriorating civilian and military situation in the region is ably outlined for the reader. Due notice of the conflicting loyalties and war weariness of the populace is made and detailed attention is given to the Confederate struggle to assemble regular, reserve, and home guard units for local defense in the face of increasing Federal military activity. On the Union side, the raiders employed a policy of economic destruction. Plantations along the route of advance were thoroughly stripped of forage, livestock, and foodstuffs; additionally, an estimated 600 slaves were liberated. Cox writes very well, and his account of the conduct of the raid and the Battle of Marianna is richly detailed and skillfully analyzed, with eyewitness accounts seamlessly incorporated into the narrative. Thorough in his research, the author appropriately notes where source materials conflict and his assessment of contradictory accounts is evenhanded. Cox also sought the truth behind several of the myths and legends surrounding the Battle of Marianna. For example, he did not find convincing evidence of a massacre of Confederate prisoners by angry soldiers from the USCT units. Also, Cox's arguments convincingly retrieve the reputation of Confederate Col. Alexander B. Montgomery, who was viciously attacked by newspapers and local historians for his conduct during the Battle of Marianna. Supplementing the main text, several appendices are included in the book. They range from casualty lists (prisoners and dead) to rosters and short biographies of members of home guard and reserves units that participated in the battle. A list of recruits obtained during the raid by the two USCT units is also compiled. My only complaint is with the book's cartography. The West Florida overview sketch labels only four locations and the two period map reproductions are small and difficult to read. A map tracing the complete route of the Union raiders and another detailing the Marianna street grid and battlefield would have been very helpful. The Battle of Marianna, Florida is a completely original and most welcome piece of regional military history. This book is carefully researched, soundly analyzed, and well written, and I would recommend it unreservedly to anyone interested in the Civil War in Florida. Connoisseurs of obscure or forgotten military actions will also be richly rewarded. --------------------------------------------------------------------Author Dale Cox is also revising and expanding an earlier study of the Union attempt to capture Tallahassee in the spring of 1865. The Battle of Natural Bridge, Florida has a planned publication date of July 31, 2007. Judging from the level of dedication evident in his prior work, I am greatly looking forward to reading it. --------------------------------------------------------------------Also available from here . On the North and South Magazine messageboard, author Gordon Rhea posted about the progress of the final volume in his Overland Campaign series. It is planned for a late 2009 release. Michael Hardy's ruminations (here and here) about the possible connection between the aftermath of the 1861 Unionist revolt in E. Tennessee and the formation of a North Carolina unit, the Mitchell Rangers, reminded me of a short history that I recently read. 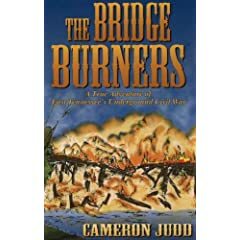 Fiction writer Cameron Judd made a foray into non-fiction with The Bridge Burners: A True Adventure of East Tennessee's Underground Civil War (Overmountain Press, rev. 1996). It's a history of the November 8-9, 1861 East Tennessee Unionist citizen uprising that resulting in the burning of several bridges of the vital Virginia and Tennessee rail link. It certainly marked the end of the Confederate conciliatory policy in East Tennessee, exemplified previously by Gen. Felix Zollicoffer's military rule. Written in a stirring novelistic style, this is not a scholarly work. It lacks both a formal bibliography and notes, while drawing almost entirely from well known published sources. On the other hand, The Bridge Burners is an enjoyable read, and from what I can tell, it is reasonably accurate.